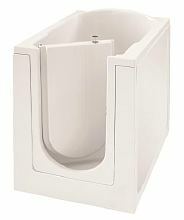 Ideal for smaller bathrooms, the Florida compact lends itself to installation where space is at an absolute premium. As the inward opening door which is positioned at the front does not encroach into the room the bath may be positioned in the tightest of spaces. The door latching mechanism is easily operated by applying gentle pressure to the mushroom-shaped button conveniently located on top of the door. Taps and/or controls can be positioned to the left and/or right of the door or mounted on an adjacent wall. Despite it's compact size the Florida walk in bath maintains a full depth of water in which the bather can immerse. Luxury option now include a heated seat, auto fill, built in sound system with Bluetooth connectivity, a three speed auto purging warm air spa system and Chromotherapy lighting. An optional glass shower screen is also available. This may however only be fitted along the side of the bath to the left or right hand side of the bather.